The fiery salute shown to the Soviet crowd by Poland's Wladislaw Kozakiewicz on the mat following his victory vault was one of the most poignant images of the 1980 Games. But his defiant gesture was simply a response to the unbelieveably partisan behaviour from the Moscow crowd - witnessed by almost every foreign competitor, especially the Poles. For his first Olympic appearance at the age of 23, Kozakiewicz had failed dismally, ending in 11th place in 1976 in Montreal. But only months before the Moscow Games, he became the first man to vault 5.70m. 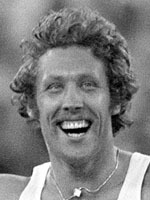 Despite the atmosphere in the Lenin stadium, Kozakiewicz vaulted all of his attempts successfully, and set a new world record of 5.78m with his second vault. The man from Poznan in western Poland took off in the direction of the contingent of Polish supporters, in the process crossing a line of Soviet soldiers and shouting "Poland will not be beaten...". Polish television was unable to send out pictures of the Games, but the photo of his "salute" made all the newspapers, including that of the underground trade union "Solidarnosc", who used it defiantly as a symbol of Polish resistance against the USSR. In July 1985, Kozakiewicz fled his native country with his family to seek residency in West Germany. He asked to be given German nationality following difficulties with the Polish Athletics Federation, who had suspended him for six months for taking part in competitions abroad without their permission.